-> increase/ elevation in levels of in glycosylated hemoglobin, plasma reduced glutathione and Vitamin C.
-> decrease in plasma insulin, liver glycogen, blood glucose, plasma thiobarbituric acid reactive substances, hydroperoxides, ceruloplasmin and alpha-tocopherol. Extract of AM leaves is capable of reducing oxidative stress by scavenging lipid peroxidation and enhancing certain Anti oxidant levels which causes lowering of elevated blood glucose level. The mechanism of action could also be speculated partly to increased utilization of glucose, either by direct stimulation of glucose uptake or via the mediation of enhanced insulin secretion. AM affects the outer membrane protein C of E.Coli (thus, anti-diarrhoeal). Ethanolic extracts of AM leaves have an anti fungal activity, and are effective against various intestinal pathogens such as Shigella boydii, S. sonnei & S. Flexneri. The essential oil from bael leaves interferes with the Ca2+-dipicolonic acid metabolism pathway and thus possibly inhibits microbial spore formation. AM leaf extracts have a hepatoprotective effect in alcohol induced liver injury. Aqueous extract of Bael fruit pulp and seeds are effective in the treatment and prevention of CCI4 induced hepatic toxicity. AM increases the force of contraction of cardiac muscles and is not blocked by Calcium channel blockers and Beta blockers. As the doses of AM extract increases there is a graded decrease in the heart rate and increase in the force of contraction. Skimmianine present in AM extract causes induction of apoptosis, and thus a hydroalcoholic (80%alcohol and 20%water) extract of AM is said to have anti cancer potential. (In Bangladesh, a lot of traditional medicine practitioners still prescribe Bael for cancer treatments). The hydroalcoholic extract also significantly decreases activity of lactate dehydrogenase and formation of malondialdehyde in liver, suggesting a role in cytoprotection as well as protection against pro-oxidant-induced membrane damage. significant changes in the levels of drug-metabolizing enzymes and antioxidative profiles are strongly indicative of the chemopreventive potential of this plant, especially against chemical carcinogenesis. AM has an Antiproliferative activity. Its extracts are able to inhibit the in vitro proliferation of human tumor cell lines, including the leukemic K562, T-lymphoid Jurkat, B-lymphoid Raji, erythroleukemic HEL, melanoma Colo38, and breast cancer MCF7 and MDA-MB-231 cell lines. A hydroalcoholic extract of AM has radio protective activity, presumably by acting as a scavenger of radiation induced free radicals and increased oxidant status. AM extract significantly reduces the deleterious effects of radiation in intestine and bone marrow (of the mice which were used for the studies). AM acts against radiation changes in peripheral blood, spleen colony forming units, and intestinal mucosa. Bael leaves are rich source of tannins (which has anti-inflammatory properties) and thus can be used to treat peptic ulcer. The tannins alleviate the pain and discomfort associated with peptic ulcer and also aid healing, by reducing the inflammation. Pyranoccoumarin isolated from the seeds of AM, show significant protection against pylorus ligated and aspirin-induced gastric ulcers and cold restraint stress-induced gastric ulcers. Gastroprotective effects could be due to increased prostaglandin production. AM inhibits absolute ethanol induced gastric mucosal damage. 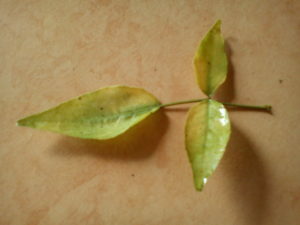 Scopoletin from Aegle marmelos leaves has the potential to regulate hyperthyroidism. AM has Antiperoxidative activity. It decreases T(3) concentration.